Local slams may organize their events in a variety of ways. In some cases the evening begins with an open mic, where both visiting and local poets can showcase their work. In many slams each evening will also include a featured poet, often from out of town, who performs a collection of their work. But always, the main event is the slam competition itself, which is almost always the last, and largest, part of the evening. 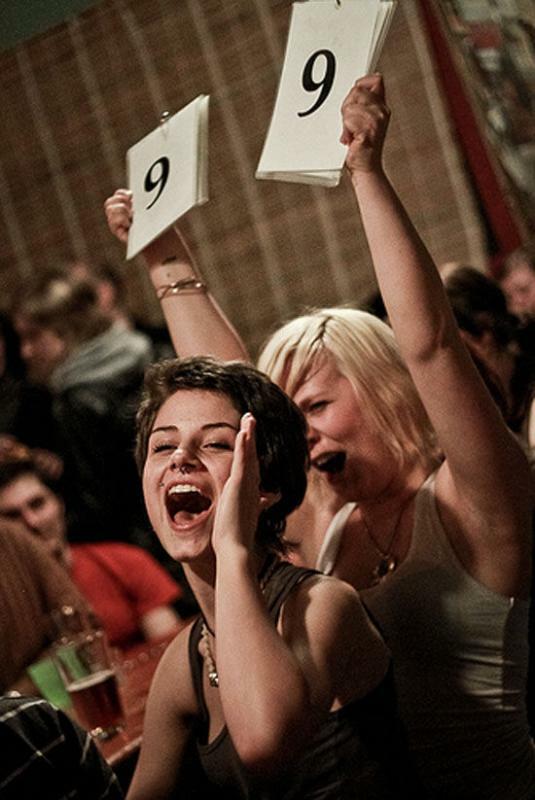 The Slam is a performed poetry competition judged by five members of the audience. Poets have three minutes to present their original work and they may choose to do so accompanied by members of their team. The judges will then score the piece anywhere from 0 to 10, evaluating both the poet’s performance and the contents of the poem. Points will be deducted for violating the time limit. The highest combined team score wins the bout. We encourage the audience to let the judges know how you feel about the job they are doing. We exhort the judges to remain unswayed by crowd pressure. We are sure that the poetry will be worth your attention. so you do - the Purpose of SLAM! You may read Disclaimer on Bob's blog here, or listen to it here (where it was featured as the first episode of the IndieFeed Performance Poetry Channel). National slam competitions are organized by Poetry Slam, Inc. and necessarily conform to more formal procedures. Here’s a link to PSI’s rules for those curious enough to dive into the details. End encompassed in the final round, the playoff between the best competitors, the audience’s bias informed by the earlier rounds, the suspense leading to the final scoring, the announcement of the winner, and the awarding of the prize. Find your local slam and get involved, by searching our master database of all slams, worldwide! Join us!! !